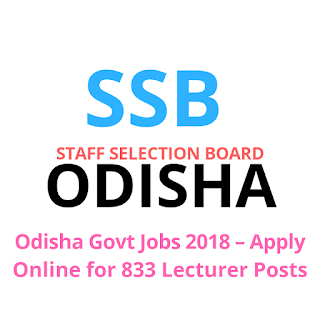 Online application is invited from the prospective candidates for the recruitment of 833 (eight hundred and thirty) posts of lecturers (DP posts) in the scale of pay, which is 4,600 / - -rs .34,800 / - which will be given grade of Rs 4,600 / - (Matrix - according to the 7th pay matrix 10) For various non-government aided colleges in various subjects. Posts are temporary but are likely to be permanent. Candidates need to apply online through the website www.ssbodisha.nic.in on the link available on this site. No other means / modes for submitting application will be accepted. The age limit of the general category will be 21 years and the maximum age of 42 on September 1, 2018. The above mentioned upper age limit is relaxed for scheduled castes (Scheduled Castes), Scheduled Tribes (STs), Socially and Educationally Backward Classes (SEBCs), women, candidates for categories of ex-servicemen, for 05 (five) years. Similarly, for the PWD category candidates the upper age limit is reachable for 10 (ten) years, whose disability is not less than 40%.